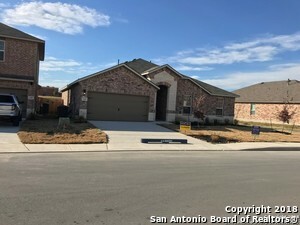 All REDBIRD RANCH homes currently listed for sale in San Antonio as of 04/22/2019 are shown below. You can change the search criteria at any time by pressing the 'Change Search' button below. "2-story, 4 bedroom, 3.5 bath features 3649 sq ft. First floor offers an entry way that leads to a study, utility room and powder bath. The entry hall opens to an eat-in kitchen, dining area and a large living space that extends to a covered patio. The master suite is located off the living area and features a master bath with walk-in closet. The second floor highlights an open game room area, media room and storage area. Two full baths and three secondary bedrooms with walk-in closets." "SPECTACULAR, METICULOUSLY KEPT TWO-STORY IN PRETIGIOUS REDBIRD RANCH!! Only two years young, this home has been upgraded with numerous expensive features and is completely move-in ready (SEE LIST OF UPGRAEDS IN ADDITIONAL INFO. 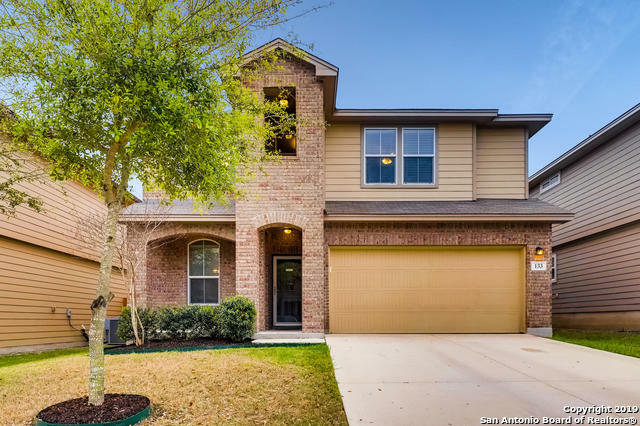 Faux wood blinds, gorgeous chic window treatments, super high-tech NEST thermostat/doorbell/camera/ security system, water softener, garage finished out with paint and additional storage. Exterior boasts a huge covered patio with afternoon shade and detailed landscaping!" "LIKE NEW! Looking for the perfect size home for a large family at an affordable price? Well look no further! 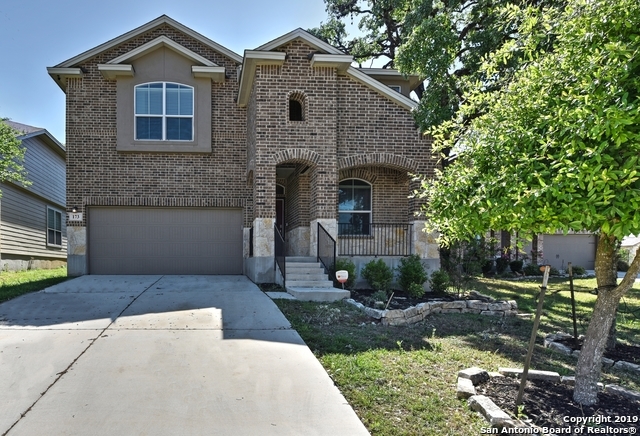 This spacious 6 bdrm,3.5 bath home boasts TWO master bedrooms (1st &2nd floor masters). This home is perfect for a family w/ live-in relatives OR roommates! Enjoy meals & entertaining in an open concept living area with HUGE kitchen island. Home offers 3 living areas, living room, media room & game room! Newly added spa shower in main master bedroom. Walking distance to elementary school"
"1 story, 5 bedroom, 2.5 bath features 2770 sq ft. Layout offers an entry way leading to a powder bath, utility room and private hallway connecting a full bath and 3 secondary bedrooms with walk-in closets. Entry way opens to a dining area and open-concept eat-in kitchen. Secondary room off the kitchen is perfect study, office or guest space. The kitchen flows into a large living room and covered patio. The master suite is located just off the living area and offers a nice master bath with walk-i"
"Rare 5 bedroom Beautiful home loaded with upgrades. 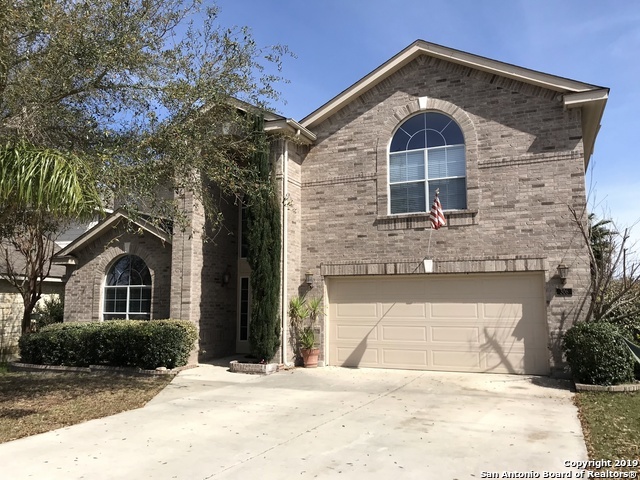 Solid flooring downstairs for easy maintenance.Open floor plan.Kitchen features granite counters w/cabinets galore & oversized island/breakfast bar. Large bedrooms throughout each with walk in closets.Master retreat is spacious with high ceilings, Bath has a garden tub, sep. shower,double vanities & large walk in closet. The covered patio and large yard is great for family entertaining.Sellers are ready for quick move in.NEW ROOF March 2019 w/5"
"Beautiful 4 bed/3.5 bath home in community of Redbird Ranch on nearly 1/4 acre lot. Marquis home w/ 10 ft ceilings throughout 1st floor. Kitchen offers gas cooking, 42 cabinetry, breakfast nook, & gleaming granite counters. Bright, open formal dining & living space w/ brick fireplace. Master suite down w/ tile shower, garden tub, & double vanities. Generously-sized secondary bedrooms down. Gameroom + full bed/bath upstairs. Three car garage! Enjoy summer BBQs on the covered patio overlooking the"
"**OPEN HOUSE - SAT FEB 16th from 1-4pm** MODEL HOME FLOOR PLAN in popular Redbird Ranch with HUGE BEDROOMS! Open, flexible floor plan features multiple living and dining areas. Neutral paint and flooring throughout to compliment any decor. Eat-in kitchen boasts large island, granite counter-tops, breakfast bar, beautiful cabinetry, and stainless steel appliances. Arches and wall niches are great architectural details. Backyard boasts covered patio with privacy fence- great for outdoor entertaini"
"FULL of natural light, this charming & spacious home is located in highly sought Redbird Ranch. Large backyard w/2 patios perfect for entertaining! Interior features include grand entry way, open concept floorplan, stainless steel appliances, 2 living areas, gameroom/loft, study/office, 4 bedrooms including master w/large bath, separate shower, 2 walk in closets. Study can be converted into 5th bedroom! Neighborhood Amenity Center! 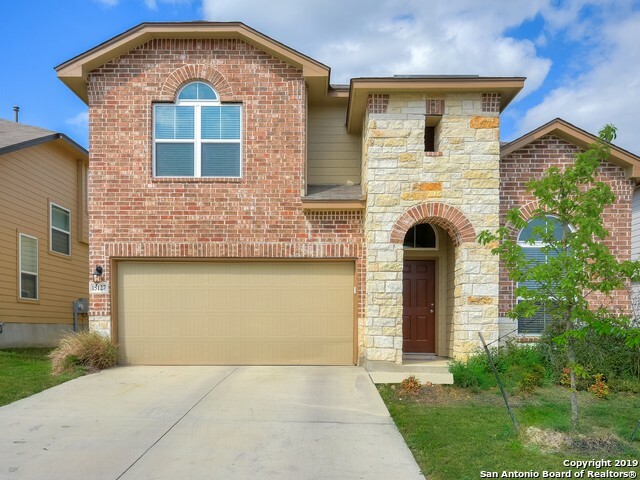 Easy access to LAFB, Sea World, Alamo Ranch, Downtown. *Shed/Spr"
"PRICED UNDER MARKET VALUE ! - - Two Masters ! Updated: Flooring, Paint, Light Fixtures, Appliances, Mirrors, Master Bathroom, Custom Features w/ Surround Sound, and many more ! Pool, Clubhouse, Park/Playground, Sports Court - close proximity to schools / stores / restaurants / -- Easy access to Hyw's and Military Base." "Enchanting & Elegant - Your New Dream Home Awaits! Captivating 4 BR 3 1/2 bath w gourmet kitchen, media room & game room will win your heart. This open floorplan says: you are home - away from the hustle & bustle of the big city. Kitchen features granite counters w/cabinets galore & oversized island/breakfast bar. Hill country stone fireplace in LR. Dual masters - 1 up; 1 down. Spacious study w glass insets French doors & wood floors - could be used as 5th BR . Plus fabulous neighborhood "
"Green space! Two living areas! Eat-in kitchen and formal dining room! Bright Spacious Kitchen with Island, Stainless Steel Appliances, Recessed & Pendant Lighting! Abundance of cabinets in the kitchen with a walk in pantry! Windows allow an abundance of natural light! Large Master Suite Overlooks the Striking Green yard and has Spa Like Bath! Extravagant Master Closet for maximum organization and storage! 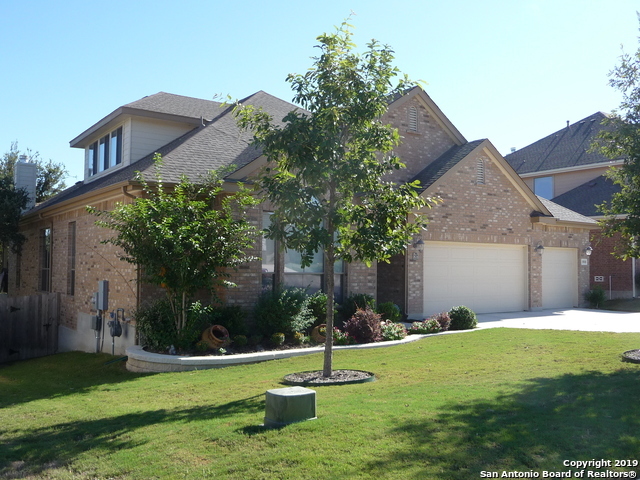 Covered Patio Overlooking Large Lush Yard w/Mature Trees! Minutes To Lackland AFB." "EXPRESS 4 BEDROOM 3 BATH 2702 SQUARE FOOT HOME WITH MASTER DOWN, OPEN PLAN WHICH INCLUDES A STUDY AS YOU ENTER, LARGE FAMILY ROOM, THAT OPENS TO DINING AREA, LARGE ISLAND IN KITCHEN INCLUDES GRANITE AND STAINLESS STEEL APPLIANCES WITH GAS OPTION, LARGE MASTER SUITE INCLUDES SEP/TUB SHOWER, DOUBLE VANITY AND LARGE WALKIN CLOSET, 2 ADD'L OVERSIZED BEDROOMS DOWNSTAIRS, AND UPSTAIRS OVERSIZED 4TH BEDROOM WITH ITS OWN BATHROOM AND LARGE GAMEROOM FOR FAMILY TO ENJOY, COVERED PATIO FOR FAMILY BBQ'S AND"
"This 1-story, 4 bedroom, 2 bath home features 2540 sq ft of living space. This layout offers an inviting entry way leading to a full bath, utility room, three secondary bedrooms and a private study or office space. The entry hallway also opens to a large eat-in kitchen, dining area and a spacious living room, perfect for entertaining! Off the living area is the master suite featuring a nice master bath with generous walk-in closet. Also included is a large covered patio and 2-car garage." "Beautiful home 4 bedrooms (2 masters bedrooms), PLUS office and second living area, 3.5 baths 2 car garage. Solid flooring downstairs for easy maintenance. Open floor plan. Kitchen features granite counters w/cabinets & over-sized island/breakfast bar. Large bedrooms throughout each with walk-in closets. Master retreat is spacious with higher ceilings, Bath has a garden tub, separate shower, double vanities & large walk-in closet. 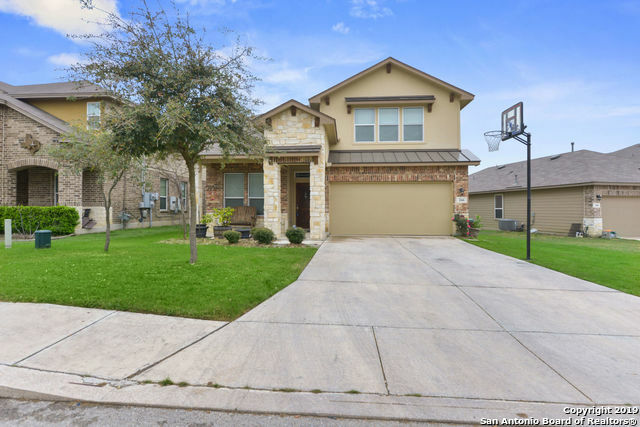 The covered patio and large yard are great for family entertainin"
"Built in 2011, this San Antonio two-story home offers stainless steel appliances, granite kitchen countertops, and a two-car garage. A community pool is part of the HOA. Home comes with a 30-day buyback guarantee. Terms and conditions apply." "Charming and spacious home located in highly sought Redbird Ranch. Home is located in a cul-de-sac w/ mature trees, backs up to greenbelt, and has a large backyard perfect for entertaining! Interior features include open concept floorplan, 2 living areas, 3 bedrooms downstairs including master w/ large bath & walk in closet. 2nd level includes large gameroom/loft area and bedroom perfect for entertaining! 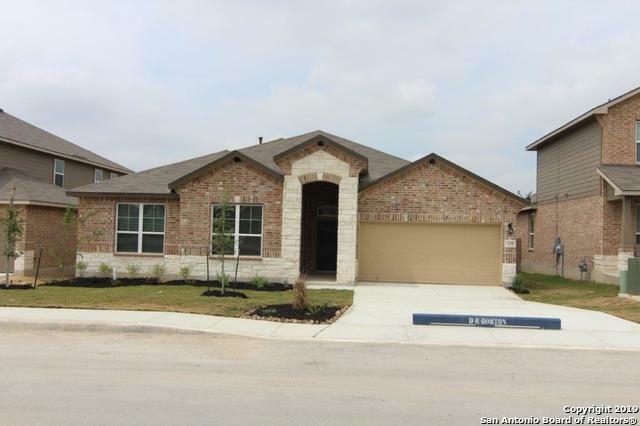 Neighborhood has 2 amenity centers w/ LAFB, Sea World, Alamo Ranch, & easy downtown access!" "Military-owned. Situated on a 1/4-acre corner lot, with impressive curb appeal, and a 3-car garage, this well-cared for home offers 2682sf of flexible living spaces with the 4 bedrooms 3.5 baths you need. All Solid FLooring Downstairs. Offset 1/2 bath. Extra storage. 2nd Master Down. 6 month-old appliances. Gas Cooking. New Carpet on Stairs and in Game Room. Close proximity to the upcoming HEB Grocery Store @ Potranco and 211!!! Close to 90/Lackland AFB. Call us to see this home N"
"$4000 toward BUYERS CLOSING COSTS, Better than new, meticulously kept home is looking for it's new family. 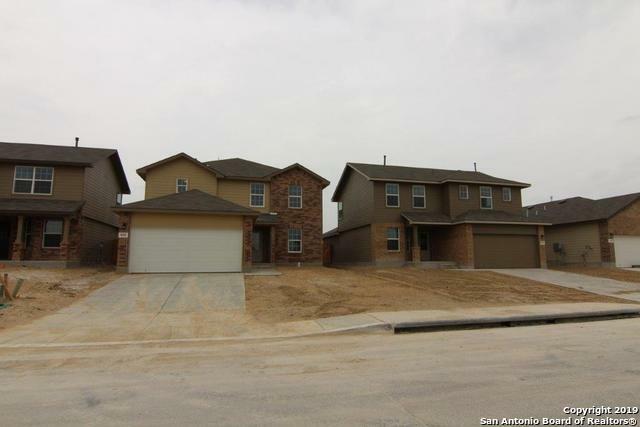 Home features master bedroom down, brand new wood floors, stainless appliances & blinds throughout. Entertainers paradise from the spacious open concept to the covered patio. Upstairs you'll find a huge game room, separate theater and 3 bedrooms. Beautiful community, wonderful neighbors and amenities galore. NO CITY TAXES, Medina County! 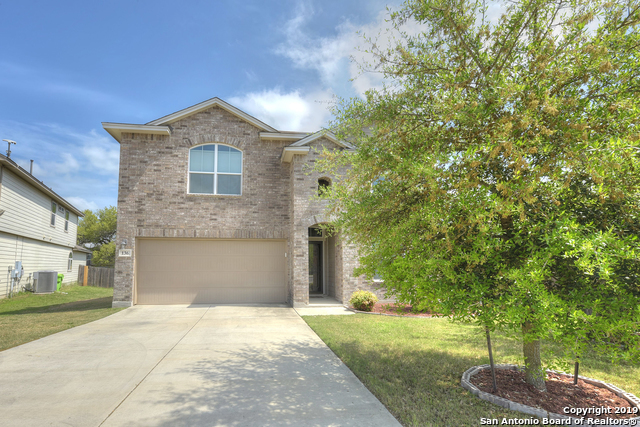 Conveniently located near JBSA-Lackland, major attra"
"Seller Will Pay First Year of HOA Dues!! No Kidding! This is a Deal! Check $/Square Foot!!!! This home has the study, the dual living areas, the huge game room, the custom-painted media room, the downstairs master bedroom with dual closets, the granite-island kitchen with two walls of cabinets and counters...space for everyone and everything! Tile kitchen, backsplash, and wet areas. All solid flooring downstairs. Available for immediate move-in. Enjoy the pool, tennis, Clubhouse, park/playgro"